Thank you Charles. I think it is a good idea to promote WebGL demos/games for this technology which is promising. And I’m sure I’m not the only one. I’ll try to include a suggestion form to help the website and listen to everyone ideas. I’m actually contacting other persons playing with WebGL to add them on the website. But as gilles from learning WebGL I get an “unsupported” error although I try it in Chromium (Linux). gwtquake/467C963030334F33D5FBE8BFBB59B43F.cache.html:6029Did the exception test appear above? Does not appear to work for me. =[ Gets stuck at loading the last image or creating an audio element. I updated the page about supported browsers. About the errors I’ll look the log but I think it is related to the browser more than the game. It takes awhile to load some of the files and it appears to be doing nothing, but it loads and plays. This works beautifully on a Webkit Nightly (in particular r59204+). Multiplayer, it attempts to connect to 127.0.0.1 – if I’m not mistaken, it makes use of WebSockets but I dont think HTML5 WebSockets has support for UDP? About UDP you are right. It is not supported directly by WebSocket but the connection is not done by the client directly, but through the server using the WebSocket. 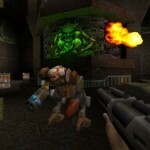 I’ll install a Quake 2 Server too allow multiplayer. Amazing to play such a game in a browser. Running with –enable-webgl –in-process-webgl works in chromium! Probably Chromium (Minefield too) Nightly Builds are not stable enough. I don’t know more about it but the best way to try the game is to try with another browser/version. Chromium seems to freeze on both machines though. Yes, my server is actually down because of a storm. I’m getting another one. I’ve put up a mirror until the normal server is back up. Its back up again… had to do some maintenance and forgot to restart it. Pretty impressive! It does show that Chrome’s WebGL still has its work cut out, as it was rather slow on my dual-core Athlon X2 @ 1.2 Ghz. The browser will probably freeze up if you don’t include –in-process-webgl. Looks likes it only works in Google Chrome 6, so don’t try it in version 5,7,8 or 9. I think Quake 2 webgl needs an update. hi guys, haha.. it works here. firefox 4 beta 8. but mous sensitivity is killing me (I would need to switch my desktop mouse sensitivy down). and the game is not easy to play because it’s not in da flow :) I get stops, and hangers all around. I am on a windows7, i5 fujitsu business notebook and have enough 2D/3D performance. maybe I need to wait for updates here. cheers and thanx for the site. With WebKit Version 5.0.3 (6533.19.4, r75891) on iMac 3.06 GHz Core 2 Duo and 4GB 1067 MHz DDR3 I got 15-30 fps, but the sound is often delayed. 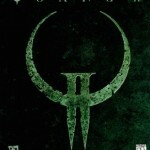 Why not a Quake I version! Kind of doesn’t work because half of the resources are 404′ing. The port for Symbian runs faster on a 369MHz CPU without a FPU. WebGL is nice but it needs GPU accel. I don’t see enemies and my weapon. It’s normal? Sometimes with the lag yes. Works, but doesn’t show models, only bsp. Also some textures seem to be missing. Everything nice, but how the hell do I exactly apply the thing for Chromium? If you give info what is needed to make it run, also would be good to tell HOW to do it, yanno? The latest Chromes and Chromiums can’t render models anymore for some reason, but Firefox 4 works natively. The multiplayer, however, only works if you use a developer option to turn Websocket on.